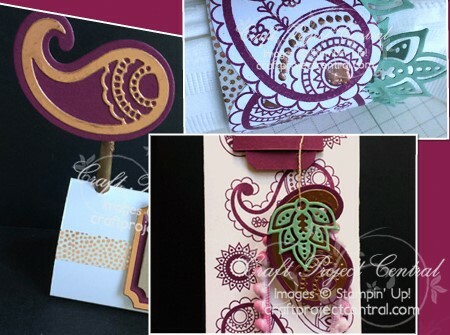 Just Julie B's Stampin' Space: Paisley Party Ensemble! Do you love to entertain? Whether it’s a small gathering or a formal meal, this tutorial has a few special touches for you to make. This ensemble provides those little things that you can turn to time and time again whether you’re having friends over for nibbles and drinks or for a celebratory meal. There’s even some packaging included so that your guests don’t go home empty handed. This pretty project was made by Sara Levin and you can get her tutorial when you subscribe to the month of September over at Craft Project Central.